Please note that there will be NO ACCESS in our former north carpool area outside of the Wasatch Too building. 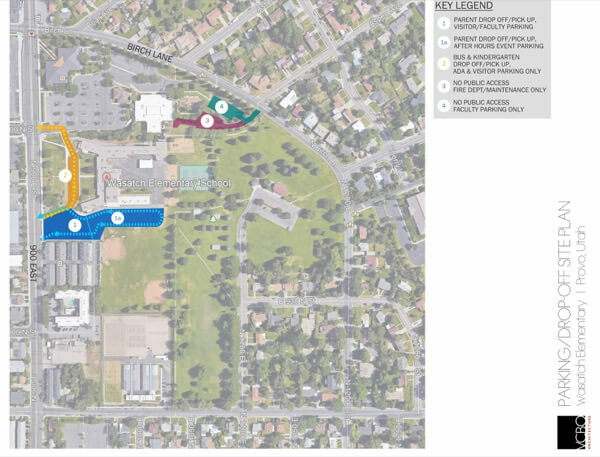 All carpool traffic will funnel through our two areas at the main entrance and the south playground areas. Walking and biking students may access the Wasatch Too building through doors at the northeast and south of the school. Theses doors will be locked at 8:40 each morning. The only remaining open door will be the main entrance at the front of the school, and will remain the only entrance throughout the school day. If carpooling home, please arrange to pick up your child in one of the two carpool areas. Due to change in carpool drop off and pick-up, we encourage neighborhood students to carpool together whenever possible. Parking in the northeast lot of Wasatch Too will only be available to Wasatch Staff. We appreciate all of our Wasatch parents and students’ patience as we work through our ‘growing pains’ in the interest of our students’ safety.